During my student days, I would occasionally post about my parents and their cooking- or rather the lack of it. See post on attempting to cook in my parents kitchen, the lobster incident or my personal favourite, the Christmas vegetable stir fry. Since leaving home I have cooked in their kitchen only a few times as the lack of equipment has totally driven me mad. Hollandaise Sauce with no whisk- are you crazy? Then there are the fond memories of being served up tandoori chicken made with strawberry yoghurt and the thing I could have sworn was over cooked pork chop but actually turned out to be lamb. But apparently things are changing. Today Dad e-mailed me with the link to his new website. That’s right. He’s got a food blog. Hell has frozen over and pigs are airborne. A few weeks ago, the very lovely Alex of Eating Leeds tagged me for this meme, the idea being that I share seven random facts about myself. So here goes…. I am a chronic insomniac. I’ve not been given proper medication for it but I randomly discovered last year that a certain anti-allergy tablet knocks me out like a light. I discovered this while suffering a horrible reaction to an antibiotic. The pharmacist at first suggested I might have an allergy to cheese or red wine. I nearly cried. I really, really, really want a polydactyl cat. Preferably a black one. I’ll call it Sekhmet. When I was at university I used to love being in musical theatre. I never got a main part though and was eventually driven to leave after being cast as a prostitute four years running. No one needs that kind of typecasting. I have two phobias. The first is sometimes crippling and I won’t mention it here because I’ve learnt that some people have a cruel sense of humour. The other is vertigo. I was painfully geeky as a child. Adventure games were my life and the number of Star Wars/Star Trek/ Babylon 5/… the list goes on …..lines I could quote was just embarrassing. Fortunately I’m now over that although a lot of Red Dwarf has persisted in my memory. When I was thirteen years old I was convinced that I would neither get married nor have children. In fact, I was so sure of this that I made a bet with my best friend of the time that if I was wrong my children would be slaves to her! If I was right she would give me 1 million pounds. The bet takes effect at age 35… and to be honest my feelings haven’t changed much…. so, Sun-Hee, you’ve got 7 years before you owe me that million. In theory I’m supposed to tag seven people to do this now but as I’m usually the last to get round to memes, I’d probably just end up tagging someone who’s already done it. So I’ll say, let me know if you haven’t done this meme and want to be tagged and I’ll link to you. That’s an understatement. It’s f*cking freezing. I swear there hasn’t been a winter this cold since I moved back to London. I have swapped my pretty fur trim gloves for big thick things that look like they belong in a boxing ring and still I can’t feel my hands by the time I get home. In fact yesterday I couldn’t feel anything below my knees either, which led to a very embarrassing tumble outside Tesco. Even in weather like this, I still get bored of stews so I’ve been trying to vary them as much as possible. Veal blanquette has made an appearance as has a spicy root vegetable and lentil curry but this week’s favourite was the one below.It’s an interesting combination of flavours: slow cooked beef with warm spice, sweet sultanas and a slight bitterness from the pepper.I blogged it a few years ago before my hard drive crashed but that page is in quite a state so it is worth reproducing. Brown the beef in a medium suacepan (I needed to split it into 2 batches). Remove the heat and set aside. In the same pan sautee the peppers until soft. Remove and set aside. Add the shallots to the pan and allow to soften. Return the beef to the pan and stir in the spices. Add the beef stock and bring to a simmer. Simmer uncovered for 30 minutes. Stir in the chopped squash, vinegar and and simmer for another 30-40 minutes until the beef is tender and the squash soft. Taste and season and serve over the tagliatelle. Regrettably, I’ve never been to Japan. I hope to one day. It sounds like an amazing place and the little bits I hear about the culture fascinate me. Of course, the cuisine captivated my attention as soon as I heard about it. Raw fish! How many other cultures will serve this up? Ok, there’s the cured salmon we have in Europe and things such as ceviche in Mexico, but not such a range as you’ll find in Japanese cuisine. Having said that, I remember being unimpressed the first time I was introduced to sushi. Those little rice rolls from M&S in the mid nineties did nothing for me. But then, sometime during my student years, I was at a certian popular conveyor belt restaurant and discovered sashimi. My fellow mathmos raised their eyebrows slightly as I devoured several plates of raw salmon and tuna and then they indiscreetly pointed ot that I was now responsible for most of the bill. Within the last week or two I visited a nice Japanese retaurant in Westminister, heard a friend wax lyrical about his amazing new life in Tokyo ad was told about a nice restaurant in Barcelona that I must visit if I ever got around to going there. I take this all to be a sign that I should learn more about Japanese food. So my starting point was to buy some Japanese ingredients I hadn’t used before. In the dish below, which is an amalgamation of various ideas I found online, we have my new purchases of mirin and soba green tea noodles. I used these and some wasabi powder and pickled ginger to create something which is probably not much like a real Japanese meal but at least is a step in the right direction. I’m not confident enough in my knife skills to atempt tuna sashimi yet. I go for the next best thing- tuna just seared so it’s practically raw but the very outside is cooked. 350-400g fresh tuna steak in one piece. I find that it is best to let it come to room temperature before searing it. Prepare the vegetables and coriander. Rub the tuna steaks all over lightly with sesame oil. Season and sprinkle with sesame seeds. Sear over a high heat until just cooked on all sides, Wrap in kitchen foil and leave to rest in a warm place. Make up the mirin dressing. Combine the dressing ingredients as listed above. Taste and adjust to your liking. Cook the soba noodles according to packet instructions, drain and refresh in cool water. Toss the noodles with the spring onion, cucumber and coriander, then toss the mixture in the dressing. Place a portion of the noodle mixture on each serving plate. Thinly slice the tuna steaks amd arrange over the noodles. Sprinkle with sesame seeds. Serve with the matchstick vegetables and the wasabi and ginger. I did a bit of research on my two new ingredients. Mirin is an ingredient I haven’t knowingly encoutered before, although no doubt it was one of those flavours in plates of sushi unidentifiable to me. True mirin apparantly is about as alcoholic as sherry, although versions with less than 1% alchohol are produced now which have the same flavour. The flavour is unique and very strong, but dominated by a heavy sweetness. The word soba can refer to any noodle of medium thickness- i.e. not an udon noodle. Usually they’re eated cold with a dipping sauce or dressing or hot in a broth. Mixing them with salad vegetables like this is a fairly modern idea. My soba noodles were flavoured with green tea but the flavour was barely discernible even before the dressing was added. Also, Goon says the noodles don’t taste good raw. He should know, he ate a quarter of a pack. You probably guessed that yourselves without trying them. …to those of you who have tried to contact me via e-mail. I still have no home internet and our school server appears to not like my web based mail page. I can read your messages as they come into my Blackberry but I have no easy way of retaining or replying to the messages. Blame BT.Apparently I have missed some good blogger meet ups. Boo! West London really is the place to be at the moment. This morning I discovered that what appears to be the world’s biggest Waitrose has opened by Shepherd’s Bush Green along with 40 or so restaurants as part of the Westfield development. This shopping centre is ludicrously large. I intended to ‘pop in’ today on my way into school to see what the fuss was about. Not only do you need a map for the development itself, individual shops are big enough to merit having their own complex floorplans. At one point I found myself looking diagonally across the centre so most of it was in my sight. It was so enormous, I had a slight attack of vertigo, felt a bit sick and had to leave. Then it took me 15 minutes to get to the exit. Yes it is THAT big. So big that, if it wasn’t for Wholefoods, it would render Kensington High Street totally redundant. So here I am, nestled in between cheap restaurants, the best butcher in London and a gargantuan shopping centre. This is my smug face. Goon has become a bit disconcerted at my sudden good mood. I suppose that from his point of view, his girlfriend has undergone a complete personality transformation, from grumbling and snarling to generally quite happy. If it wasn’t for BT, I would only have one other complaint: the seemingly endless stream of colds. Colds are an occupational hazard for teachers, particularly when they’re new to a school. I can’t remember a day this term when we (the maths department, that is) were all sniffle free. Germs like children and children like giving their germs to teachers. Fortunately I know the best thing to treat a cold: a big bowl of curry. I have more than made up for last year’s lack of curry making and have been trying to expand my repetoire. The dish below originates in Indonesia and is lightly spiced and not at all hot. It’s perfect if you want something pleasantly invigorating but aren’t in the mood for a chilli based assault on the senses. It’s so mild that you might not class it as a curry, but it hit the spot for me, especially after the burningly hot Thai curry I made the previous night. It’s quick to make too, so a perfect schoolnight dinner. Get a large frying pan hot and stir fry the squid until it just curls up. Remove it from the pan, place it in a bowl, toss in the lime juice, cover and keep warm. Turn the heat down to low, add a little more oil, then add the onion and garlic to the pan and cook gently until soft. Add the tomato, stock, cloves and nutmeg. Stir well, ten allow to bubble gently until almost dry. Taste and season. Stir in the squid and warm through. 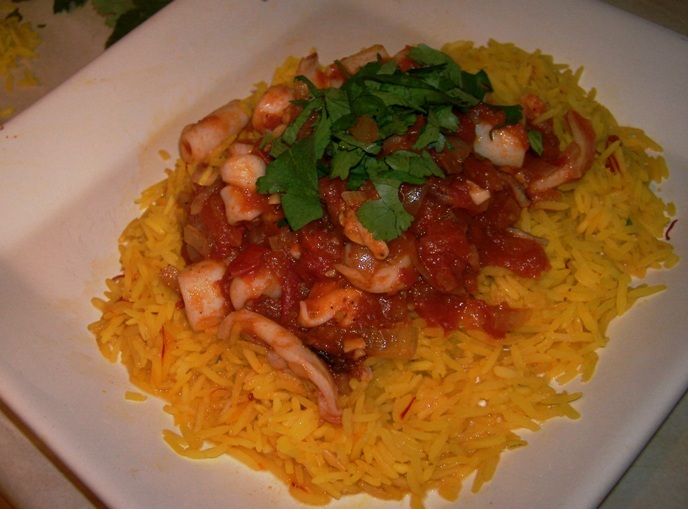 Serve with saffron rice or plain boiled rice, garnished with chopped coriander and/or spring onion. That has got to be the understatement of the year and, to be honest, it is not so much technical problems but extreme technical incompetence. Apparantly it takes over two months for BT to set up Option 1 broadband. This morning, after spending two hours on the phone to their technical support ‘gurus’, I was told that actually no one had a clue what was going on with my internet and I would be offline until at least November the 4th. Somewhere in India, there are two helpdesk people, sitting, shaking, and possibly crying underneath their desks. I have given up my policy of not blogging from my workplace and have come into school to write a post even though it is half term. Other than lack of technology and blogging equipment (I also had no desktop, no photo software and my camera card reader got lost somewhere in my move) things are pretty sweet in West London. I found a flat which is essentially a large kitchen with attached sleeping area. It has an ancient rickety gas cooker, which has already caused me several burns, but, hey, at least it’s gas! The freezer is on the barely existing side, but to make up for it I have a big pink sofa. Yay! Now that I’m back, I’m quite convinced that my irritation at living on the Islington-Hackney border was not just a case of the grass being greener. I am so happy to be back in Hammersmith. My flat is within 10 minutes walk of at least eight nice but affordable restaurants and at least two nice but more expensive restaurants. Roll on payday! A five minute detour on my way home from work takes me to what must be the best butcher in London. The supermarkets are decent. True, a floor assistant responded to my request for black pudding by taking me to the chilled dessert section, but I found brawn in the bargain bin! ! Woohoo! I also have a supply of interesting ingredients from Shepherds Bush market and a load of expensive but bizarre things to gawp at in Wholefoods. The new job seems very promising too….. but more on that later. I’ve been spoiling myself this month, eating and drinking far too much. This has had the effect that I am skint, yet again, until I get paid on Friday. To avoid this happening next month, I am using the fact I can’t visit my butcher on Sundays to force myself to eat more vegetarian food. Last Sunday I didn’t need much convincing. After a heavy weekend I go off the idea of meat and start craving grains and other healthy foods. I used the opportunity to make myself a few portions of a nourishing meal that would freeze well, just in case work gets more demanding as we head towards mid winter. Tortillas to serve with soured cream and grated manchego (or mild cheddar) cheese and possibly a nice green salad. Put the onion and garlic in a large saucepan and fry gently in the olive oil. Chop the coriander stem finely- about a handful would be good- throw this into the pan with the spices. When the onion is soft, add the red pepper and allow to sweat, pan covered, for a couple of minutes. Let the mixture simmer, covered, for half an hour, stirring occasionally. Uncover, take off the lid and allow to bubble down to a thick sauce consistency.. Taste, adjust spicing if you like and if you’re that way inclined, add a shake of tabasco. Just before serving, stir in a couple of handfuls of chopped coriander leaf. 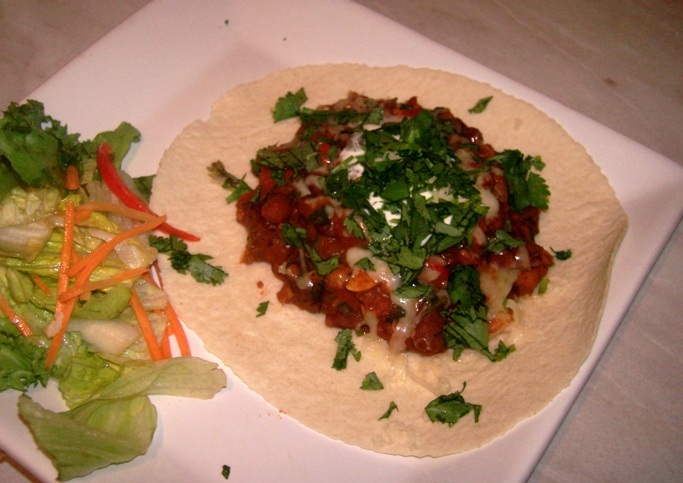 Serve on flour tortillas with a big dollop of sour cream, grated machego cheese, some more chopped coriander to garnish and a simply dressed green salad. I have missed blogging a lot. Now I’ve started my new job, I should have time to write a couple of times a week so hopefully, as soon as I have a net connection I’ll be back for good and I may even be able to let you see what the kids here have been cooking in our after school club. Wish me luck! It would appear the internet I had ready set up in the new flat was cancelled by the old tenants. Can’t say I blame them, athough it would have been nice if the estate agents had mentioned something. Tonight I am posting from Goon’s flat, 5 minutes from Covent Garden Market, where we have just been shopping. We had some more oysters and fizzy, then I went haywire and bought some spicy salami, some pecorino, olive oil and balsamic syrup. After tasting the salami and cheese, Goon decided he wanted sausages and something cheese related for dinner, so I went and bought some additional good quality pork sausages and red onion chutney and we are now waiting on some hot dogs with smoked paprika wedges for dinner, while nibbling on the salami and pecorino. It took us 40 minutes to work out how Goon’s new grill worked. This is why my gas cooker rocks, even if I’m paying more than Goon to live in zone 2. I also bought Goon a cake from Lavender Bakery. I ate most of it. This is why I don’t make cakes: I would end up the size of a house. Due to internet setup times I may be away for a week or so. No matter, it will give me time to sort out the interesting fungus growing on my new kitchen’s window. Ah, the joy of renting…. There have been a few occasions when I’ve wondered why I blog. With the abuse from former students, the idiots who ‘tlk in txt spk n thnk yr fd lks dsgustin rofl lmao’ and the sheer amount of time it takes to write a post and upload some pictures, you have to wonder why we bother. But then I remember all the fantastic people I’ve met through this site: other bloggers, a few readers and various people in the food industry. That makes it worthwhile in itself. Then there the few occasions when you get invited to some really great events. Last Friday I was lucky enough to be asked along to have a look around the Covent Garden Night Market. This is a summer special. It runs through August on Thursday and Friday evenings hosting some fantastic stalls and catering for a variety of tastes. As well as tasty things to munch on while you’re there you’ll find all kinds of foodie delights: breads, meat, game, teas and coffees and Italian olive oils and vinegars as well as some of the Borough Market regulars. I arrived shortly after 6pm last Friday, just in time to meet some other food bloggers including Helen, Julia, Niamh and Krista before the entertainment began. Each Friday at 6:30pm the kitchen theatre on the West Side of the market plays host to some great chefs. Last week it was the hairy bikers who cooked up a three course meal of a starter with seared scallops and salmon, a Tuscan style beef salad and a dessert of zabaglione. The Hairy Bikers, being their hairy, entertaining selves. Si slices delicious fillet steak. I am jealous. Let me assure you that fillet steak was amazing. If I heard correctly, it came from the Northfield Farm stall at the market. Apparently on the 28th of August, the guest chef will be Fergus Henderson. Pig’s ear salad, here I come! After that little spectacle and almost being eaten alive by a Hairy Biker’s irate fan who NEEDED to be close to the bikers, it was time to explore the market along with Julia from a Slice of Cherry Pie and Niamh of Eat Like a Girl. The first port of call was obvious for me. Quick! Join the queue before they run out! Who could say no to oysters and prosecco? Ok, it supposedly isn’t the best season for them but they were still very good and at £10 for 6 oysters plus a glass of bubbly, they aren’t too badly priced. If you decided to indulge, try not to be like me and spill oyster juice down your arm and skirt. I smelled like fish for the rest of the evening. Classy. As we sat and ate our oysters, I thought how nice it was to meet other food bloggers, especially after corresponding for so long over messages and e-mail. It was comforting to be chatting to two other young women and find out that they’re just as terrified of motherhood as me and for the same reasons. It’s not just the commitment or the physical and financial strain that worries us, oh no. It’s the thought of 9 months with no cheese, wine or rare meat! Continuing to explore the West Piazza, we found some very tasty salami. It’s a shame that the wild boar sausage had sold out by the time we got there but we got a taste of the spicy salami. I must say it was absolutely delicious with a substantial spicy kick. And here we have a paella pan with paella.There’s always paella at these markets, isn’t there? Also present were Manor Farm. I have recommended these guys for years. If you want to catch them at Covent Garden, go EARLY. They sold out fast. Finally, I got a briefly introduced to Michelle of The Lavender Bakery who is selling some beautiful cupcakes. Look at the little biscuits! They’re sooo cuuute! This is Michelle’s first venture into retail and she is doing a marvellous job. If cupcakes are your thing, please go and support her. All in all this was a very enjoyable evening. The mood was set well by the kitchen theatre and the stalls are fabulous. This time I only explored the West of the market but I will be back next Friday to have a look at the stall selling the flavoured teas and coffees that Niamh took advantage of and the stall with all the lovely olive oils. In fact, Goon is moving to a flat just 10 minutes away, so I imagine dinner next Friday will be from Covent Garden Market. Probably with some of that fillet steak. So, not long ago I was asked if I was interested in supporting Allrecipes and their new website by giving £100 of Waitrose vouchers to a reader of this blog. What I’d give to have £100 of Waitrose vouchers now! Please note, I didn’t write this but, if you have any trouble with links, let me know and I’ll try to fix. To celebrate the launch of Allrecipes in the UK, we and our friends at Waitrose are offering you the chance to win £100 worth of grocery vouchers by proving you know your basil from your bay leaves!